Landsat 7 image of flooding near near St. Peters, Missouri on May 9th, 2017. Landsat 8 image showing the same area on April 28, 2016 for comparison. In late April and early May 2017, heavy rains in the Midwest gave way to rising rivers and flooding. 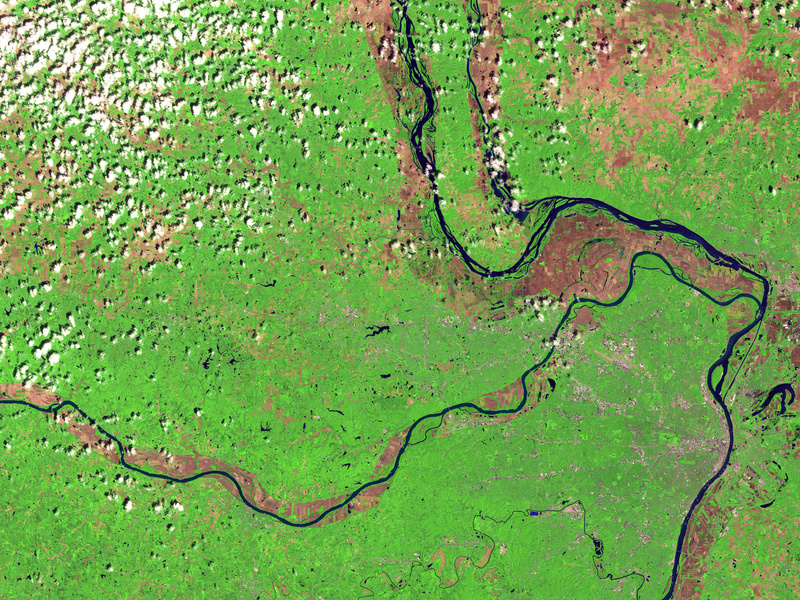 These false-color images from Landsat satellites show one affected area near St. Peters, Missouri, northwest of St. Louis. The Enhanced Thematic Mapper Plus (ETM+) on the Landsat 7 satellite captured an image (top) of flooding along the Mississippi, Missouri, and Illinois rivers on May 9, 2017. At the time, the Mississippi River was transitioning from moderate to minor flood stage. 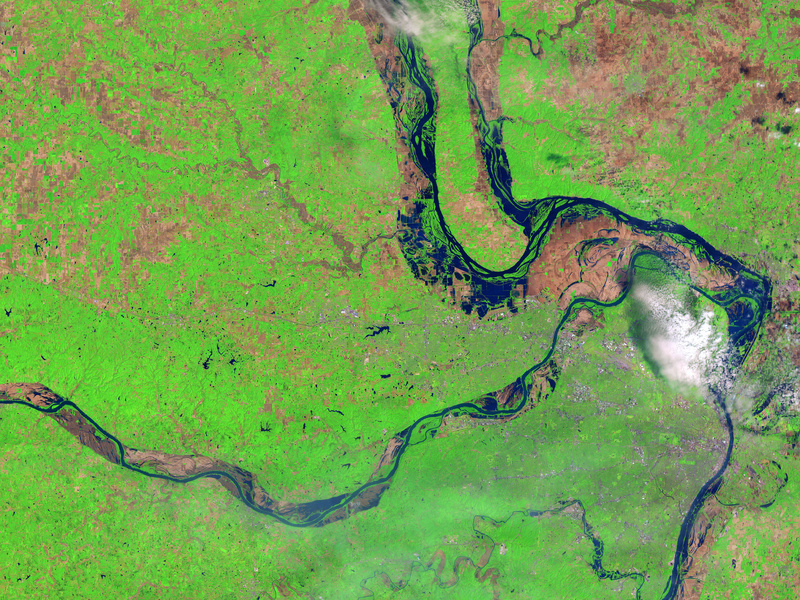 For comparison, the second image shows the rivers as observed about one year earlier (April 28, 2016) by the Operational Land Imager (OLI) on Landsat 8. Turn on the image comparison tool to see the difference. Both images combine shortwave infrared, near-infrared, and green light to highlight areas with standing or flowing water (dark blue). Vegetation appears green. Other areas across the Midwest also saw flooding, including the Meramec River in St. Louis. NASA Earth Science Disasters Program (2017, May 3) MODIS Sees May 2017 Flooding in the Midwest. Accessed May 11, 2017. National Weather Service Advanced Hydrologic Prediction Service (2017, May 11) Mississippi River at Winfield Lock and Dam 25. Accessed May 11, 2017. NASA Earth Observatory images by Joshua Stevens, using Landsat data from the U.S. Geological Survey. Caption by Kathryn Hansen.